The scene of the Infernal Machine Murders was the College of Medicine and Surgery, with its associated Marine Hospital & Invalid’s Retreat, located at the southwest corner of Longworth Street and Western Row. Still, the college hung on for more than half a century (1851-1902) surviving numerous scandals, including the horrifying “Infernal Machine” murders of 1854. The victims of this diabolical crime were Isaac Allison, 30, and his wife Catherine, 23. 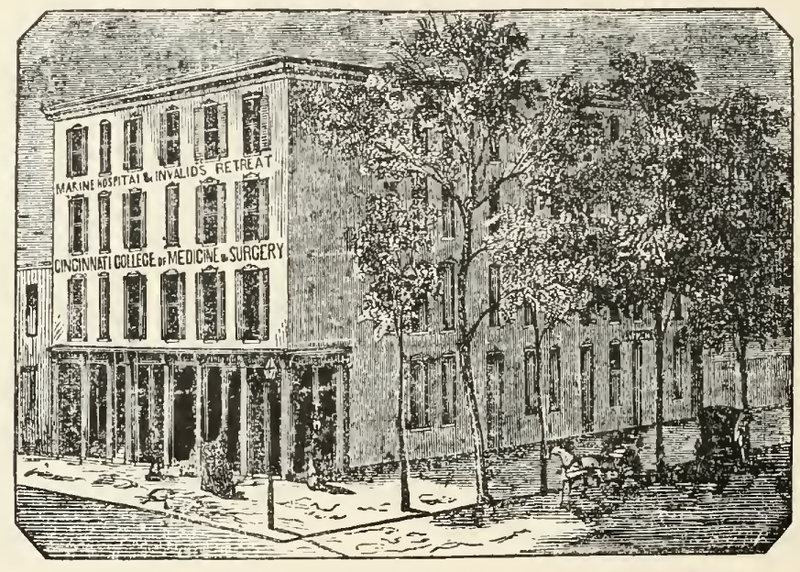 Incorporated into the College of Medicine and Surgery at the southwest corner of Longworth and Western Row was a “Marine Hospital & Invalid’s Retreat.” Isaac Allison was the steward (or janitor) of this hospital and also a student at the medical college. Catherine Allison was a matron at the hospital. The couple lived in rooms on the second floor of the building. The murderer, William Arrison, 28,was also a student at the college. He worked as a clerk in the nearby drugstore of Loren Salisbury at Freeman and Sixth. The murderer and his victims all had somewhat shady pasts. Arrison and a brother went to California during or after the 1849 Gold Rush and subsequently corresponded extensively using code names. Allison and his wife appear to have blackmailed a burglar of national reputation, regularly receiving gifts in exchange for remaining silent about something. Fate brought the two men together at the Cincinnati College of Medicine and Surgery, where they quarreled and exchanged blows. Allison blacked Arrison’s eyes and Arrison threatened revenge. On the evening of June 26, 1854, a man stopped two boys playing on Longworth Street and gave them a dime to carry a package addressed to Mr. Allison at the Marine Hospital. With the dime in hand, the boys got rid of the package at the nearest shop. A clerk carried the package over to the college and gave it to a doctor, who passed it along to Mrs. Allison. She took the package upstairs to Mr. Allison, who opened it with terrible effect. The explosion rocked buildings for blocks around and was heard miles way. Rushing upstairs, the college doctors found the room in flames, plaster blasted from the walls, pieces of flesh embedded in the ceiling and Isaac Allison crawling around the room, blinded and disemboweled, with multiple shrapnel wounds. The left half of Catherine Allison’s body was blown away or charred beyond recognition. Isaac died in an hour. Catherine lingered in agony until morning. Suspicion, fed by Allison’s dying words, fell on the burglar, who went by the alias Connolly. As evidence piled up, however, Arrison appeared ever more guilty. As Edwin Henderson noted in the Cincinnati Enquirer [9 June 1919], William Arrison was both meticulous and bizarrely incompetent. Although witnesses placed Arrison at the box maker’s, at the drug store where he bought the explosive chemicals, and at the stationer’s where the card was addressed, it took three trials to convict him of manslaughter rather than premeditated murder. The newspapers, outraged that he was not convicted of murder and executed, blamed bribes and the idiocy of Cincinnati juries. Arrison got 10 years at the Ohio Penitentiary, but was released after eight years for good behavior. 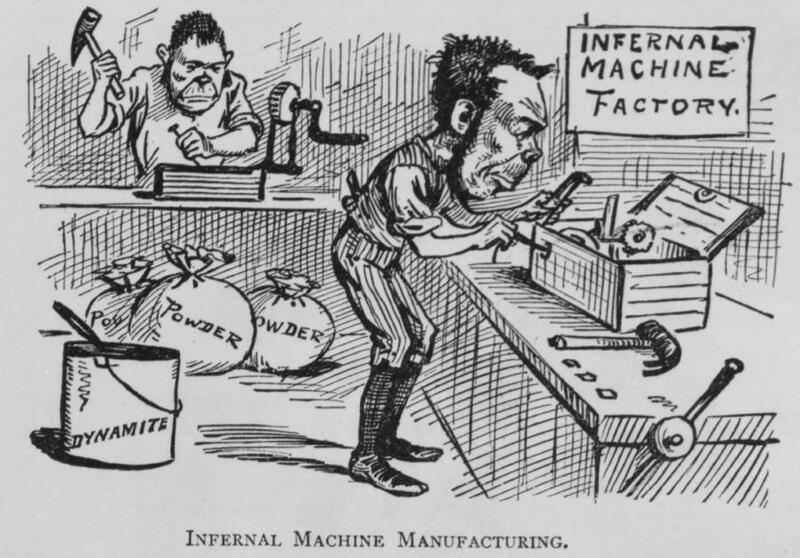 Once word of William Arrison’s Infernal Machine was published, the concept was adopted by many others, including, as this cartoon from the humor magazine Puck suggested in 1881, those working for Irish independence. On release, Arrison had the gall to move back to Cincinnati and to take a job in a pharmacy. When the citizenry began demanding that he now face trial for Mrs. Allison’s murder—his previous trials were only for Mr. Allison’s death—Arrison left town and moved back to his native Iowa. By all accounts, no violence erupted. Editor Belvel enjoyed a long and distinguished career in journalism. Arrison laid low and died around 1900 in Iowa.